On July 5, Guyana’s Ministry of Natural Resources and the Environment announced that it would suspend new river mining claims due to growing concern about widespread environmental damage. The announcement comes at a time when gold prices are soaring and many Canadian and Brazilian multinationals are scrambling to capitalize on Guyana’s vast mineral wealth. 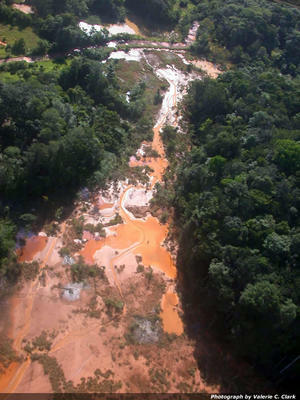 On July 5, Guyana’s Ministry of Natural Resources and the "Photo Credit - Valerie C. Clark"Environment announced that it would suspend new river mining claims due to growing concern about widespread environmental damage posing a serious threat to the country’s indigenous groups and other river-based communities. The surprising, but much needed, announcement comes at a time when gold prices are soaring on the global markets, with many Canadian and Brazilian multinationals scrambling into the country to setup mega-projects and capitalize on Guyana’s vast mineral wealth. Among the concerns the Ministry noted was a reduction in the availability of potable drinking water, as rivers have become laced with mercury and sediment due to widespread dredging, which has also resulted in the deaths of many fish and aquatic plants. The activity has also eroded riverbanks as fallen trees, gravel deposits, and sediment have altered the flow of waterways and have made many rivers impassable during the dry season. The skyrocketing price of gold has resulted in the industry becoming Guyana’s most lucrative—overtaking sugar, rice, and bauxite—and now accounts for nearly half of the nation’s GDP. In the midst of this literal gold rush, where prospectors and investors from around the world have been pouring into the country, the government has largely been unable to keep the industry under control—and the suspension of new mining permits is a clear signal that the government has a great deal of catching up to do. In May, Natural Resources and Environment Minister Robert Persaud announced that the government would open up new offices in the nation’s interior, allowing regulators to be closer to the mining sites that would make it easier to enforce environmental policies which—up to this point—are often cited, but rarely enforced, in practice. He has also promised that the fees for environmental degradation will be increased accordingly. The spill led to a $2 billion lawsuit against Omai Gold Mines, a subsidiary of Quebec’s Cambior. But the court dismissed the class action suit was filed on behalf of the 23,000 residents affected by the spill, as no criminal liability was found. To add insult to injury, the plaintiffs were also required to pay Cambior’s legal defense fees. In addition to increased regulation, Persaud also highlighted the government’s plan to build a refinery in order to reduce gold smuggling and reduce the risk that miners face in transporting gold long distances—as robberies, assaults, and murders are becoming more common in the interior. Persaud estimated that as much as 400,000 ounces (more than Guyana’s official output) of gold is being smuggled out of the country by mining companies and individuals to neighboring Suriname, where royalties and taxes are significantly lower. His own Ministry, however, is often entangled in many of the talks surrounding corruption in the mining sector. Talks are currently underway with the Surinamese authorities to encourage them to match Guyana’s 7% royalty tax, which currently sits at less than 2%. Combating smuggling and enforcing harsher environmental regulations will prove to be a difficult task for the nation of 755,000, because situated between Venezuela, Brazil, and Suriname, nearly 80% of Guyana is covered by tropical rainforest. It also leads one to ask whether or not this is simply a temporary solution, which will lack any real teeth moving forward, or whether it is the start of a serious effort to reform Guyana’s mining sector. Given the fact that Guyana has one of the hemisphere’s largest reserves of gold and other natural resources, yet remains one of the poorest Caribbean nations, is a clear sign that significant reform is needed to ensure that Guyana’s natural wealth is used to benefit the people in a sustainable way, not just foreign companies and a select few within the country. That said, any real reform in Guyana will face serious international pressures, no matter how badly domestic actors might call for it. Looking around the hemisphere, it would appear that any effort to put more regulations on mining companies is not always the safest political move—but it does not mean that it is not necessary either. Currently in Bolivia, indigenous communities in Mallku Khota have nationalized a concession granted to the Canadian mining company South American Silver, and are now planning to divert the profits into local community development. Due to the progressive policies enacted by the Morales government, Bolivia has routinely been the victim of destabilization attempts orchestrated by the United States and fearful multinationals. In Honduras, Manuel Zelaya placed a moratorium on granting new concessions to gold miners unless they had engaged in environmental assessments. It is widely looked at one of the key acts that led to the coup d’etat which overthrew him in 2009. As it stands, the high prices of gold works both as an opportunity for the government to get its hands on much needed revenue, but unfortunately also entices people and corporations to work outside of the system in order to get a higher profit in a socially and environmentally unsustainable manner. Only time will tell if the Guyanese government will enact much needed reforms to protect both the environment and all segments of society that depend directly and indirectly on mining—or if they allow the industry to deteriorate the country in favor of foreign mining interests.